England's last hopes at the Yonex Dutch Open bowed out tonight when Chris Coles and Matthew Nottingham lost in the men's doubles quarter-finals. England's three men's doubles pairs won their opening matches at the Yonex Dutch Open in Almere today, with Tom Wolfenden (pictured) and Marcus Ellis coming from a game down to reach the second round. But by the end of the day Chris Coles and Matthew Nottingham were England's sole survivors. Panuga Riou is England's only women's singles player through to the second round at the Yonex Dutch Open - and she did it with a brilliant fightback. A London Grand Prix volunteer tells us why he wanted to give up his time to promote the sport of badminton. Panuga Riou came through two rounds of qualifying in Almere today to book her place in tomrorow's main draw at the Yonex Dutch Open. The Danes added the men’s doubles crown to their women's doubles title today when 2011 All England champions and World and Olympic silver medalists Carsten Mogensen and Mathias Boe defeated Indonesia’s Berry Angriawan and Ricky Karanda Suwardi 21-13 21-16. 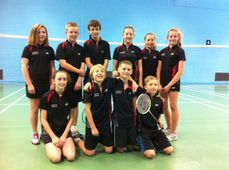 Our U13 team had another successful weekend, beating Nottinghamshire 11-9 in the Shires League on 13th October. Great job! 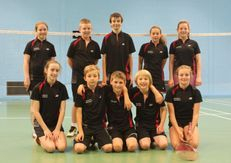 A great weekend for Team Leicestershire Badminton Juniors, with the U13 team winning 18-2 against Derbyshire in the Shires League and a U13/12/11 team also beating Derbyshire in a friendly. Congratulations to two young Leicestershire players Jai Chandarana and Hope Warner who have both had a fantastic season, the highlight being selected to represent England in their respective age groups. Congratulations to our U13 team who took part in this event. Leicestershire came joint 4th with Staffordshire. Well done! 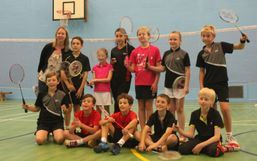 The Leicestershire Schools Badminton Association Presentation Evening will be held in the Lecture Theatre at Babingon Community College from 7pm-9pm on Friday 28th June. 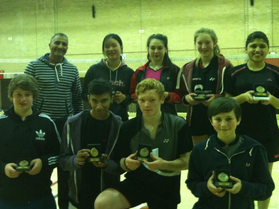 The county championships U15s provided some excellent badminton from all players. Singles winners were Hope and Jai (who also won the U13 singles the previous weekend) with runners up Michelle and Nick. The ladies winners were Chloe and Michelle, with Zoe and Wembley in second place. Jai and Nick won the mens with runners up Oliver and Bill. The mixed was won by Chloe and James. Zoe and Nick were runners up. Congratulations to all our talented U13 players who took part in the county championships last weekend. Singles winners were Hope and Jai with runners up Ella and Martin. Hope and Jai won the mixed with Ella and Martin taking second place. In the ladies Hope partnered Fatimer to take first place while Issy and Aradhana were runners up. Jai and Ryan won the mens with Martin and Tom taking second place. 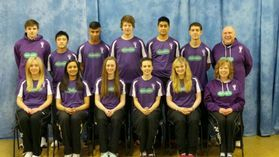 A great performance by the Team Leicestershire U17 squad who finished 13th in the 2013 Harod U17 County Challenge (ICT). Congratulations to Jacob, who has moved up from our Friday Talent Cell to Monday night Futures training. North Midway U16 League Winners - for the second successive year! Team Leicestershire U16 players had a fantastic day at Sheffield on 3rd March for the second leg of the North Midway League. Lying second on points after the first leg in October, the team of Nathan, Tyler, Danny, Nick (substitute for Jonathan, who played in the first leg), Chloe, Rachel, Kristen and Simran got off to a flying start beating Northumberland and then Warwickshire 10-0. Then followed victory over Lancashire 6-4 (the only team to have beaten them in the first leg), 5-5 against Nottinghamshire (won by just 2 points) and Yorkshire 6-4. Team Leicestershire Players have brought home more medals over the last couple of weekends with Chloe winning gold in singles and silver in doubles and mixed last weekend, then Wembly winning silver in singles and gold in doubles with Zoe this weekend in Warwick. Well done to Greg, Robbie, Stephen, Joe and Cameron for moving up from Futures to Developing Squad. Another successful weekend for Wembley and Zoe, who won gold at the Nottingham U15 Bronze Tournament. Well done girls! Congratulations to Michelle for her victory in the women's singles and to Wembley and Zoe for being runners up in the ladies doubles. Congratulations to Wembley and Ryan for moving up to the Developing Squad.